Tom Catena is your ultimate All-American guy. Graduated from Brown University. Ivy League guy, a defensive linebacker on the college football team, he could have had a career in professional football; instead, he went another route. Director Kenneth A. Carlson went to college with Catena and lost contact for years. 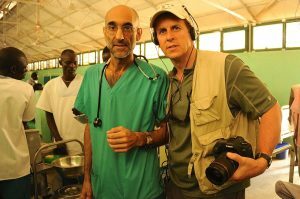 An email brought the two back together and by that time Tom had become a doctor saving lives in the heart of the mountains of Nuba. He works as the lone doctor saving lives as casualties flow in endlessly, there’s one hospital there and one surgeon, Dr. Tom Catena. The Heart of Nuba looks at his work and it’s a fascinating watch, a moving 90 minutes highlighting an oasis of humanity amid the tyranny of President’s Omar Hassan al-Bashir’s regime. We don’t hear much about Sudan but I remember when this was briefly covered on the news. What happened to that? This documentary brings Sudan back into the spotlight. I think in news media across the board, there’s a burnout across the board about Sudan. I think we went through the news cycle of Darfur. Here in the United States we all wore our “Freee Tibet” “Save Darfur” bumper stickers and we cycle through things. Darfur is still happening and it’s a painful reality. Bashir has that in check and he’s focusing on the Blue Nile State and the Nuba mountains. It continues on. It’s not the news du jour right now. Syria is, for good reason, and so is Myanmar. There’s no taking away that there are important conflicts to be covered, but Sudan has just fallen off the radar. A lot of it has to do with Africa and the interest is not that great. One of the reasons I made this film was to put it in the spotlight and do something about it. This should be on Storyville and it will be in England and put to the forefront. Fingers crossed. How did it begin for you and how did you find Doctor Tom? This is a very personal story for me. Tom and I were not only classmates but we were on the same football team together at Brown University. Not only were we on the same football team, but we were on the same defensive line. Tom Catena was a nose guard. He was All-American. Hear that again, he was Ivy League, Brown University, All-American. I was an outside linebacker. He was a monster on the gridiron and he has taken those attributes, that same perseverance and applied it to what he’s doing in Sudan now. You have to keep in mind, he being a noseguard and a defensive player, every single play was about collision, firing out, hitting the guy and trying to make a tackle, with no glory. The same thing is happening to him in Sudan and it’s one of the reasons why I wanted to shed light on him. Tom and I fell away from each other. I knew he was in Africa but I had no idea where. I received an email from another teammate from Brown University which said, “Cat Man needs our help.” I read further and I found out that a truck transporting a year’s supply of medical supplies, vaccines and food was hijacked and raided on its way to Mother Mercy Hosptial so we as a Brown Football Community raised $102,000. We bought him a new truck and filled it with more supplies and sent it to Tom. It got there two days before the rainy season started. Keep in mind, that’s 4-5 months of no transportation whatsoever. You’re stuck there and it got there just in time and it saved a huge number of lives. At that point I realized I’m a filmmaker and this seems like perfect fodder for my next film. and that’s the birth of this film. You’re filming alongside Tom, but how did you get him to say yes to this? As soon as I got the email and we sent the truck up, I reached out to him about doing a film. He wrote back, “I don’t think I’m very interesting.” He was his normal humble self. He told me he was coming back to New York for the first time in five years and that he was going to see his family but he was coming back to win an award for the Ivy Football Association. I said, “I’d love to fly out and support you in that.” I did. He came back here and used that as a flight to petition the United Nations because they had left the Nuba mountains. I pitched him the idea, he didn’t want to do it because he didn’t want the attention, but he said, if I came to Mother Mercy Hospital and make it all the way there, he’d consider it. He wanted it to be about the Nuban people and the conflict. In February 2015, I journeyed to meet him. I was held at gunpoint in South Sudan. I was on a cargo flight and offloading 50lbs bags of rice, beans and sorghum. A guy pulled me off the plane and he spat at me, yelled at me. He asked what I was doing and I told him I was a volunteer for the Catholic church and he didn’t believe me. He yelled and screamed. Finally, with boy soldiers pointing AK-47s at my head, I came clean and said that I was making a film about Dr. Tom Catena. The guy looked at me and asked if I knew him. I explained my situation and after 45 minutes of yelling, pushing and shoving, he allowed me to get back on the plane, which I did. When I got on the plane, the pilot asked if I knew how lucky I was. He said, “Two weeks ago, 26 people were pulled off this very plane, dragged to the corner of the airstrip and their throats slit and they were left to bleed out.” I told him to get into the cockpit, turn the engine on and get out of there. That was my introduction to this part of the world. I went up to a refugee camp and left at 2 a.m. to avoid any conflict. We drove and covered the vehicles with mud and we drove and sure enough as soon as sunlight hit, we were getting bombed. I jumped out, got into a ditch and bombs were landing around us. That was how Sudan was introduced to us. I want you to know that the mere mention of Dr. Tom’s name saved my life. I knew he had provided hope for a large territory in that Northern part of Africa. That’s how powerful his legacy has become. I got there and I saw him. When I last saw him, he was 245 lbs in college, he’s 145lbs now. He’s dwindled away, all he’s been eating is rice and beans. This is a guy who is selfless and as you can see, he’s brave and so smart. He speaks Arabic, but he has provided care and hope for this part of the world and I can not tell you how humbling it is to be in his presence. You’re not going to a hospital in New York. You’re watching your friend at work, doing this deed and doing good for the world. What was that like and how long did you spend there filming? I filmed for three weeks. He didn’t want me to film while I was there, but I had landed and while I was at the hospital, 17 casualties came in. I was there in the bloody mess and he threw on his scrubs and it was overwhelming. There was my buddy acting like an adult. It was amazing to see and quite the introduction. He didn’t want me to interview him, but after 8 days, I finally convinced him to do it. He’s all about the work. One of the first nights I was there, he talked about Mother Theresa and used that quote, “Find your own Calcutta.” Tom Catena had the eyes to see the need here in this part of the world and to stay and not to give up on these people after being bombed, shelled and having ground offensives staying. He’s the closest I’ve ever come to being with a saint on this earth. I hate to act like I’m idolizing him. He’s a straight average Joe who wanted to know if I had brought whiskey. He uses profanity. He doesn’t want to be considered a martyr. You see in the film, he swears. He’s not Mother Theresa meets Mean Joe Green. You’re humbled in his presence. He could have an incredible practice here in NY but he chose a different path. You take that away from the documentary, you see it’s his heart and soul. 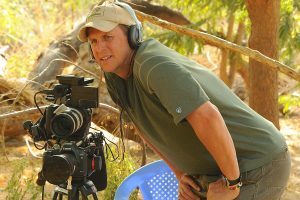 You’re dealing with this horrible regime in Sudan, tyranny, but what’s been the outcome of the documentary? I see you mentioned the UN? The guy said to me, he’d make it his number one goal to show the film to the President of Sudan, Al-Bashir. In two weeks, he called me and informed me that they had called for a ceasefire and the primary reason was The Heart of Nuba. The president responded with shock and shame and had decided to call for a ceasefire based on the film. There have been NGO’s and people and organizations that have been doing so much work including Amnesty International. We are standing on their shoulders and now people are not living in fear. They’re living a normal life and I could not be more proud of that. What an incredible achievement as a filmmaker, to have your film seen by the person who is in control, and make that impact. You know, I went back to interview Bashir. I told Nicholas about the interview, he was going to come with me, but he bailed two weeks before via a cryptic text message, and as I found out later, he had gone to North Korea to interview Kim Jong Un. I went on my own, keep in mind, I’ve signed my life over to these guys, telling them I’d lied about what I was doing and I was about to meet with the villain of my film, the antagonist of my documentary. He’s detained journalists for so many reasons. I put a microphone in front of him and we got amazing things. I can tell you right now, the reason they called a ceasefire is that they’re scared and they don’t want another Darfur. We have an incredible interview and it continued to put his feet to the proverbial fire. The biggest push we have right now, is I have commitments from every single ministry in that government. I met with all of them and they have guaranteed me, that they will create a humanitarian corridor so we can get aid into the Nuba Mountains, the Blue Nile state and that’s huge.